When Century Cycles organized and sponsored Bike To School Month at Bay High School last May, we crossed our fingers the students would participate and, wow, did they ever -- 363 rode their bikes on the first day alone! The program was such a success that we're repeating it again in 2009, with more details to be announced soon. 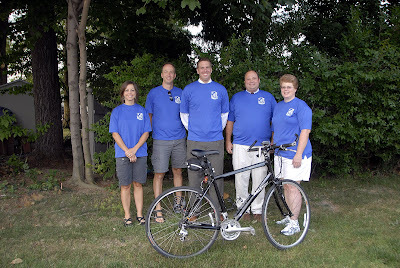 Here is our team (The Rockets) picture from the MS 150 ride. We raised $1,875 for the National MS Society and had a great time. In the picture left to right is Natalie Kimble, Rob Grossman, Mark Smithberger, Jason Martin, Kathy Tedrick. Not pictured is Lisa Smithberger who was also a team member. It is our hope to have a Bay High School team next year that is much larger! On a side note: Every team member rode a bike purchased at Century Cycles between May and June. Also, everyone went back to the store for all of their extras and for technical help in getting ready and were completely pleased with the quality and service they received!